Mating season has come and gone at Alligator Alley, but lucky for you, we’re sharing all the excitement right here on our blog! When the days heat up in the spring, the male alligators begin their search in finding their mate for the season. Yes, we did say season – Alligators are not monogamous. Are you ready to hear what summertime is like at the farm? 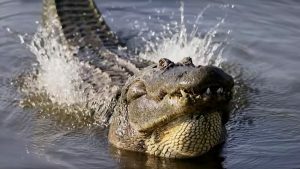 While adult alligators tend to be unsocial creatures, they do engage in complex mating rituals. Their search begins by announcing their presence with a low bellowing sound to attract their mate. Males typically slap the water with their jaws and lift their tails high, causing vibrations throughout the swamp. We like to call this their “water dance.” Like most animals, alligators use scents as well, releasing an odor from their musk glands. When an alligator finds their potential mate, they initiate direct courtship by rubbing and pressing each other’s snouts and backs. This behavior is particularly important, as it shows a sort of contest of strength while proving they’re better than other potential suitors. 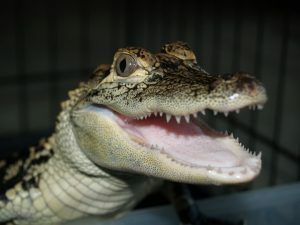 This “contest” is used to win over the female alligator and stimulate further courtship. While the typical courtship routine may last hours, copulation is very short (usually less than 30 seconds). Once the females have mated several times for the season, they begin to build a nest from mud, plants and sticks to lay their eggs. 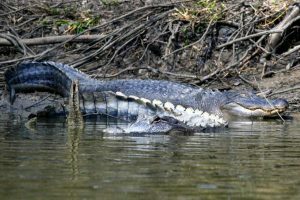 The typical alligator lays between 20 to 50 eggs. 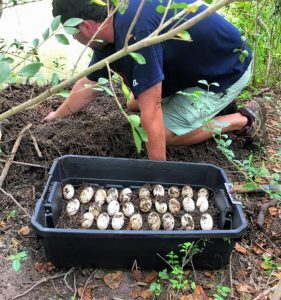 After the hard-shelled eggs are laid, the mother alligator will cover them with more mud, sticks and plants and wait for their arrival during their 65-day incubation period. If you’re interested in reading more about the harvesting of eggs, we’ve got it all here! Or, if you’re ready to visit these creatures in their element, stop by Alligator Alley. And remember, our live feedings happen everyday at 11, 1 and 4. We’ll see you soon!